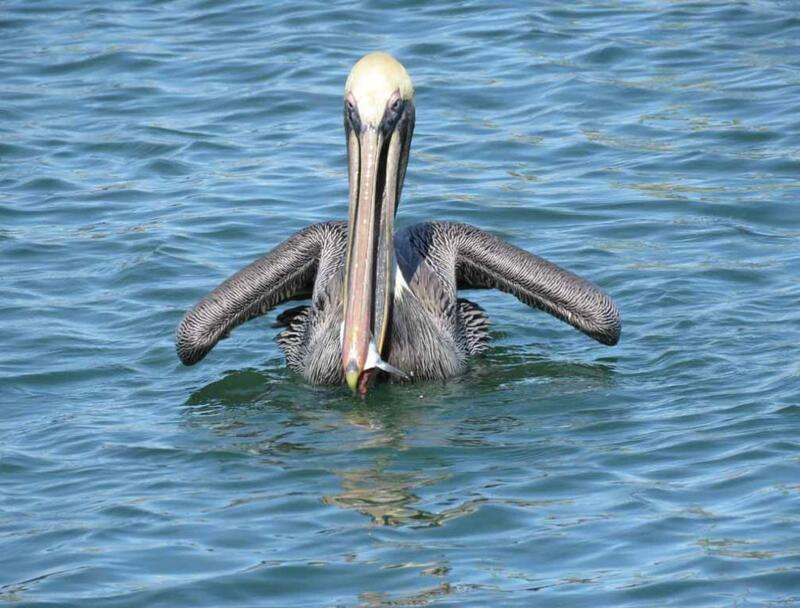 (361) 749-4158. 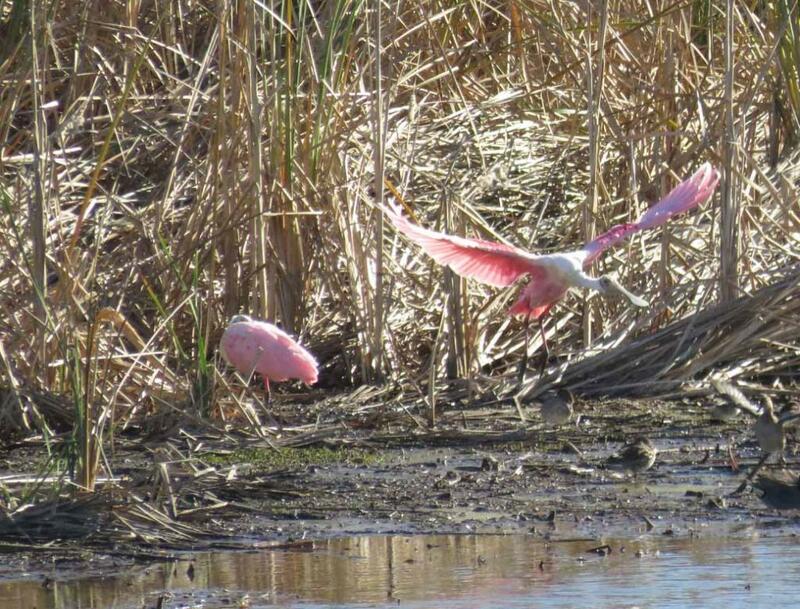 It is home to numerous species of birds, including many roseate spoonbills. 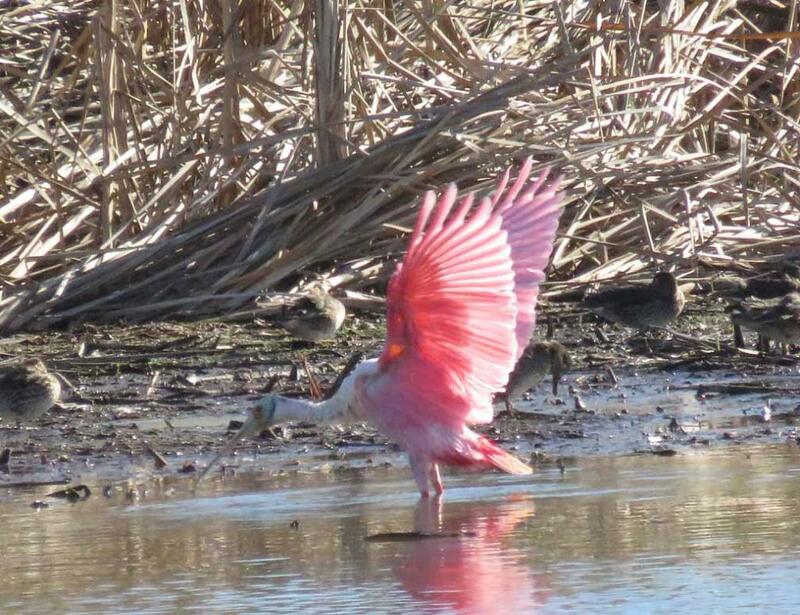 Fantastic flaming pink color of roseate spoonbill. 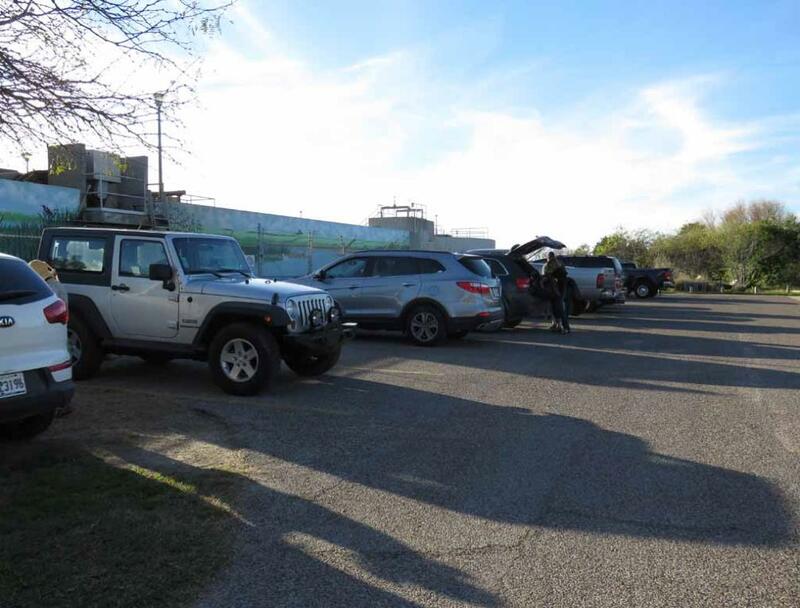 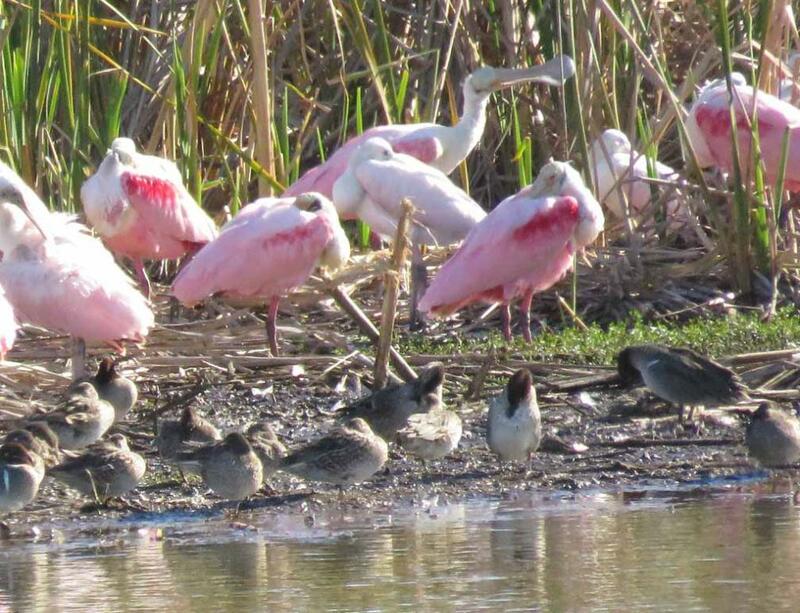 Center in late afternoon for bird and wildlife watching. 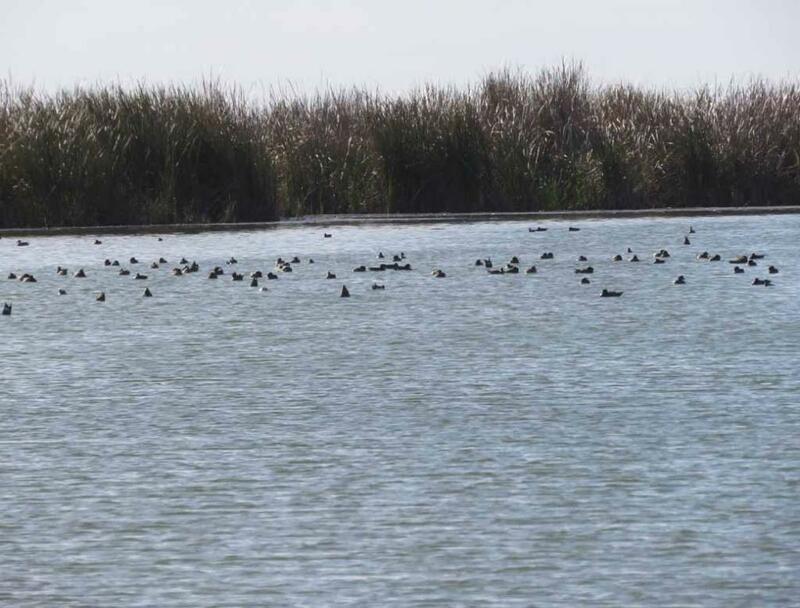 such as Mustang, and the ponds here offer a consistent supply of water for a wide variety of wetland wildlife. 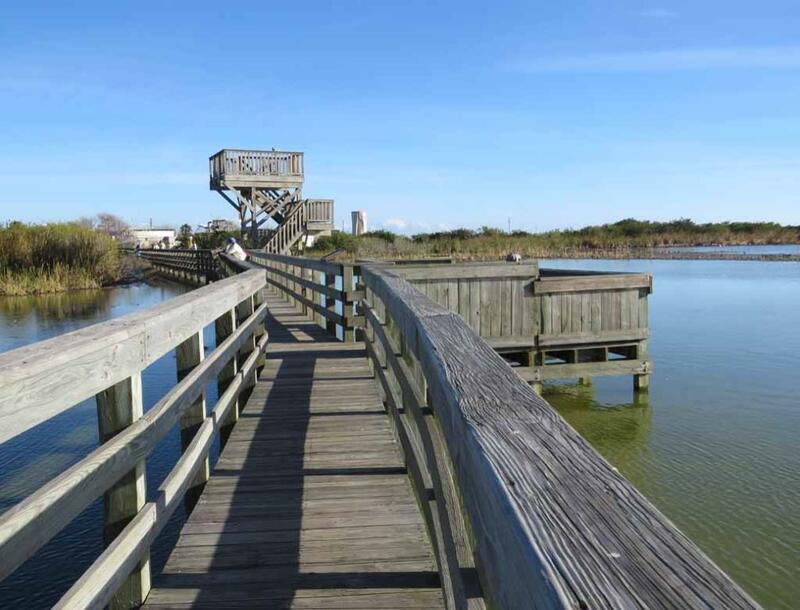 tower halfway down the boardwalk permits a panoramic view of the large pond and the surrounding flats. 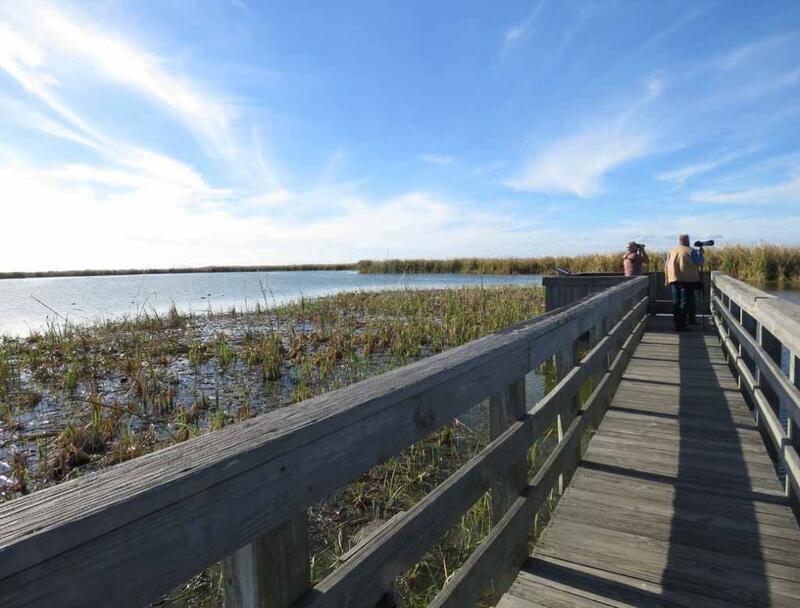 just a few yards of the boardwalk and are very easily photographed. 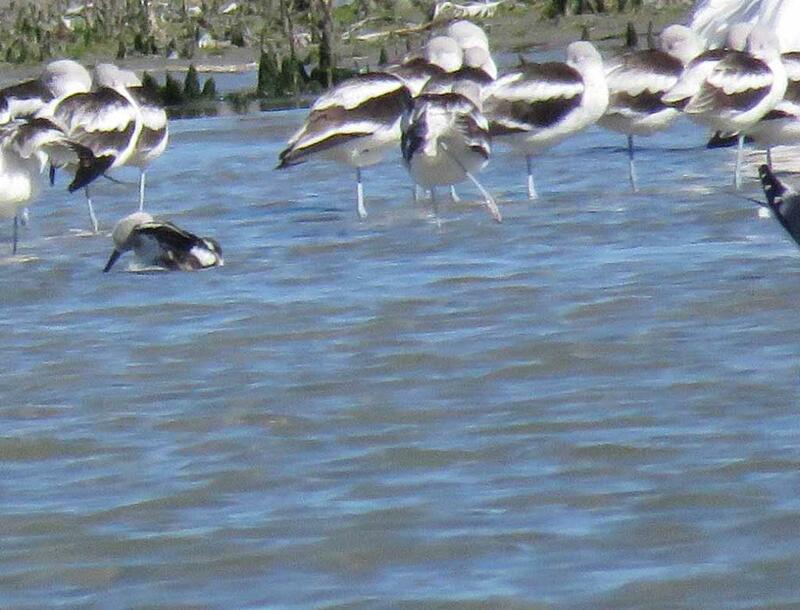 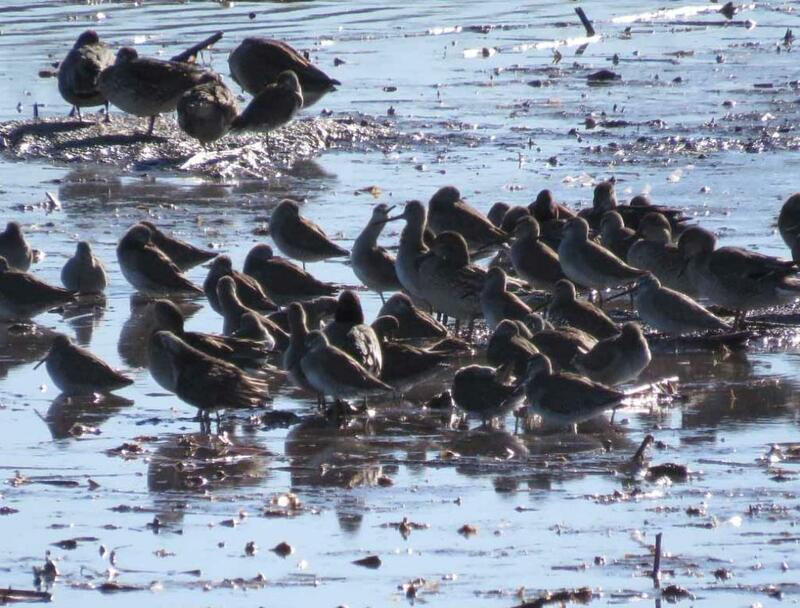 Many shorebirds on the flats. 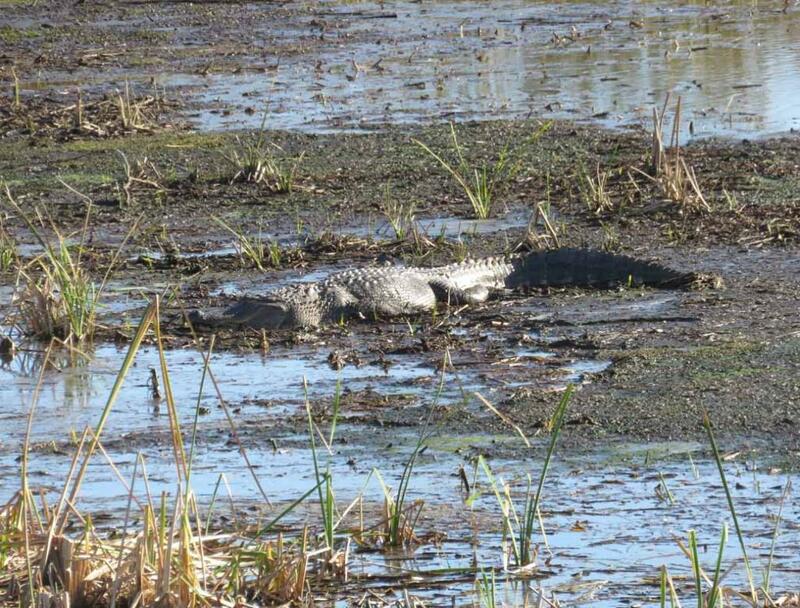 One of two big alligators about 9 feet long was sun bathing on the flat. 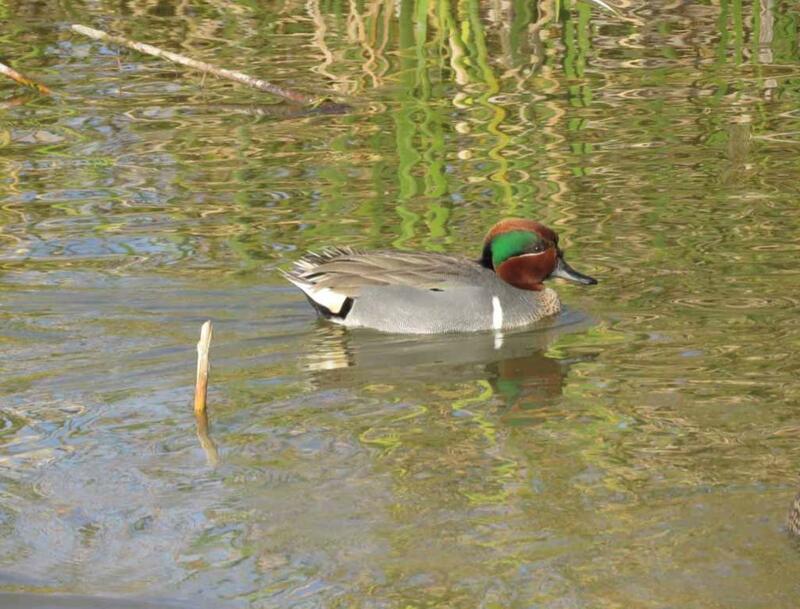 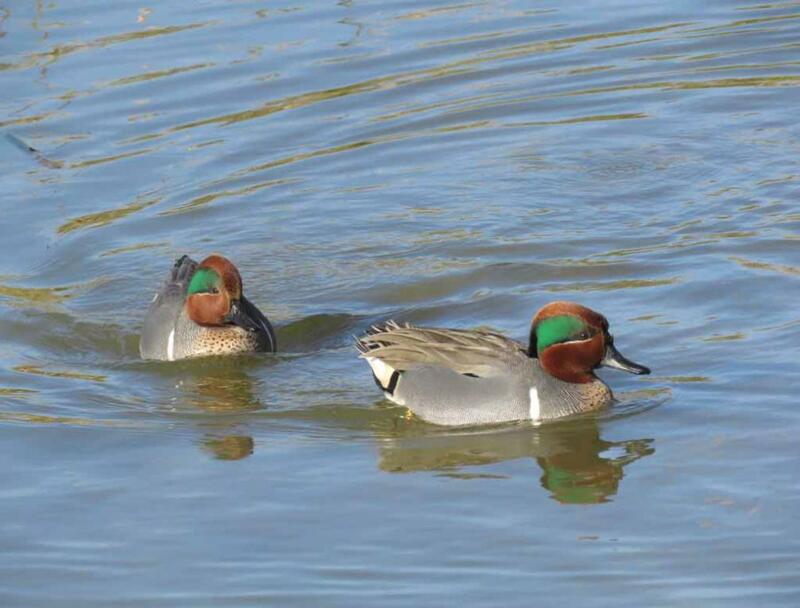 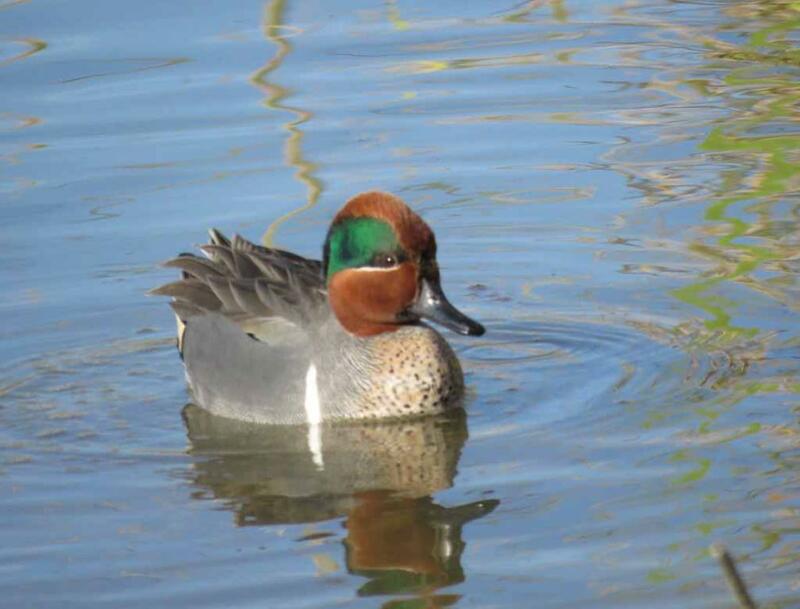 One of many very colorful green winged teals on the pond. 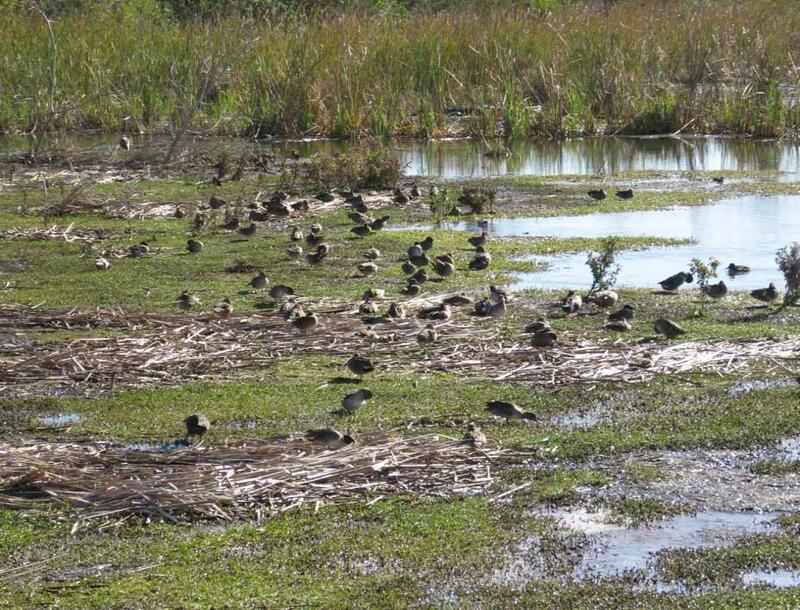 adaptation for a bird that feeds in muddy or vegetation-clogged water. 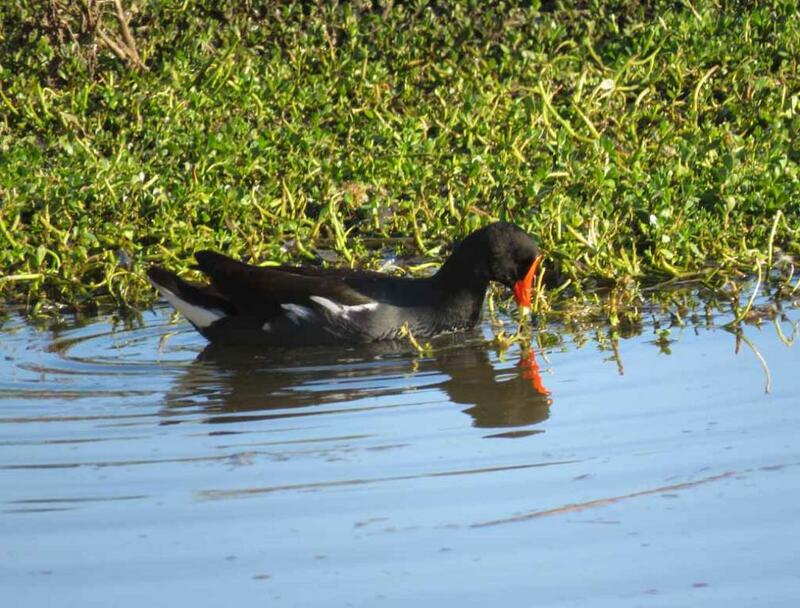 One of several Moorhen with red bill on the Pond. 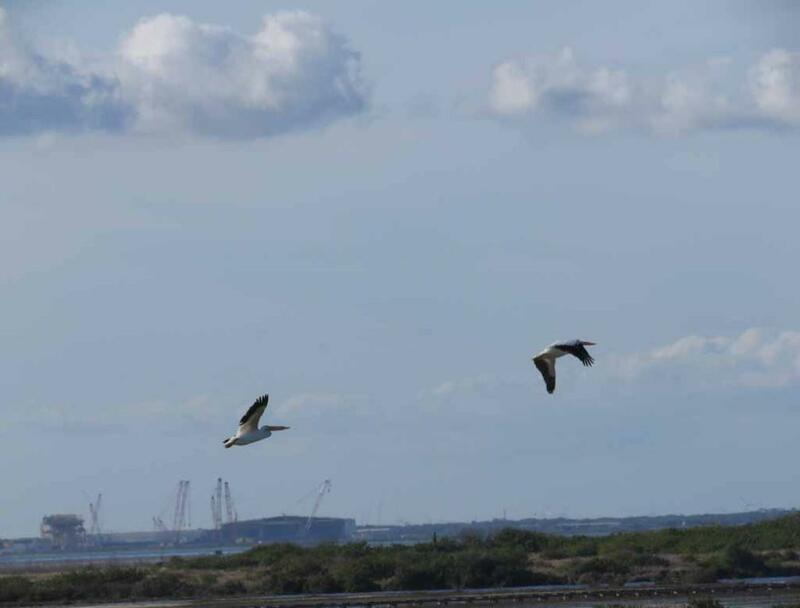 one can also see the Corpus Christi Ship Channel at a distance. 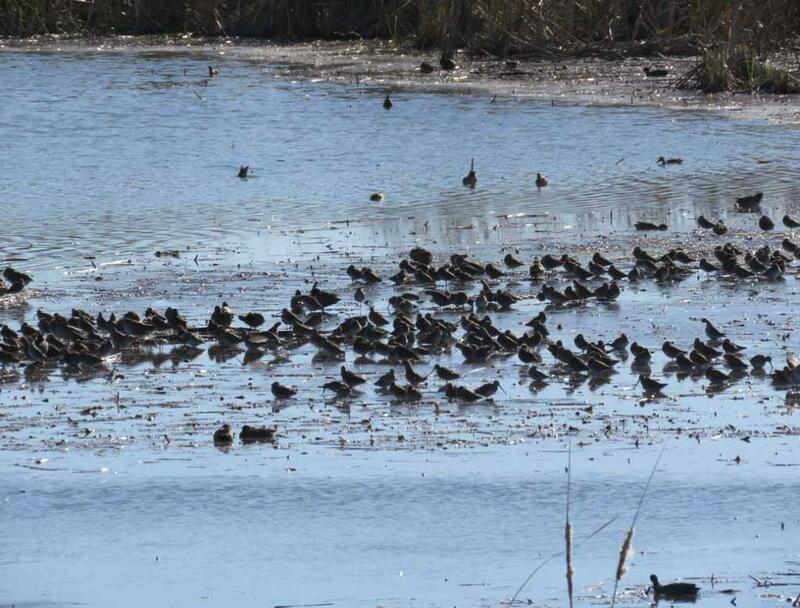 Many birds on the flat and the pond. 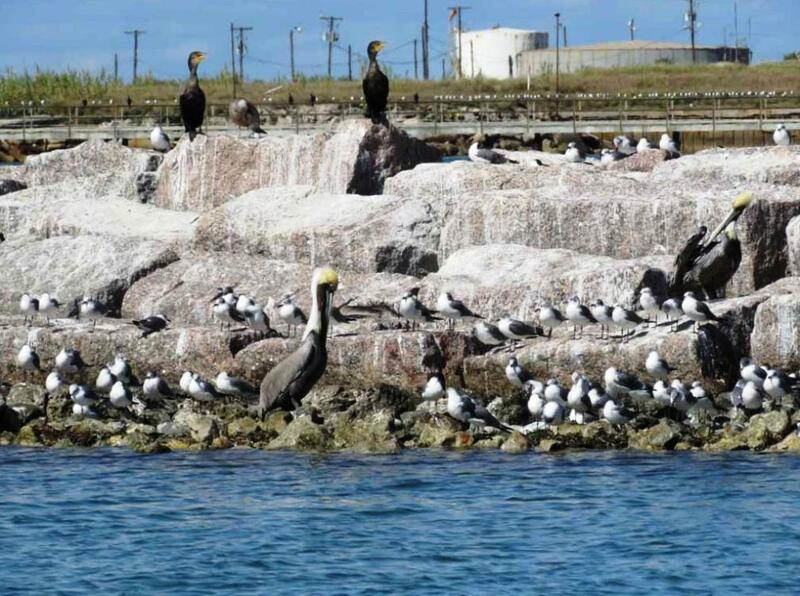 wastewater treatment plant located at south end of Ross Avenue, Port Aransas, Texas. 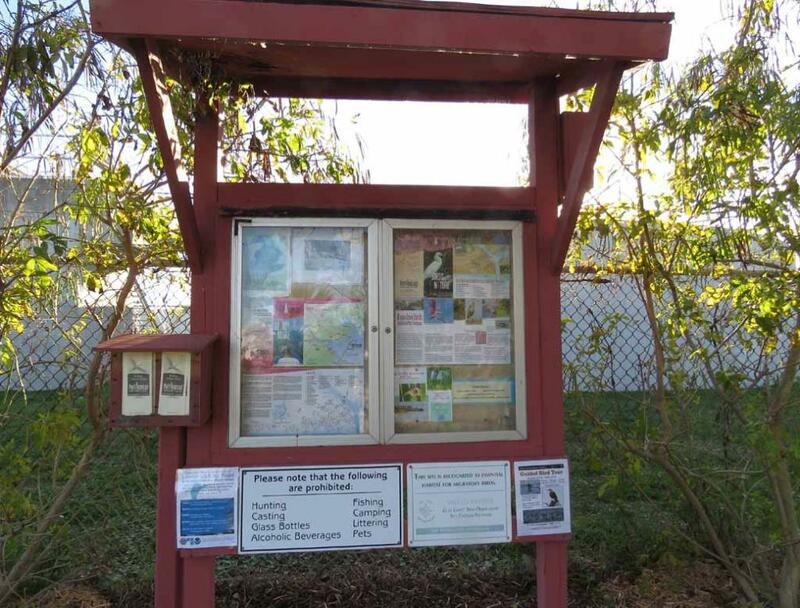 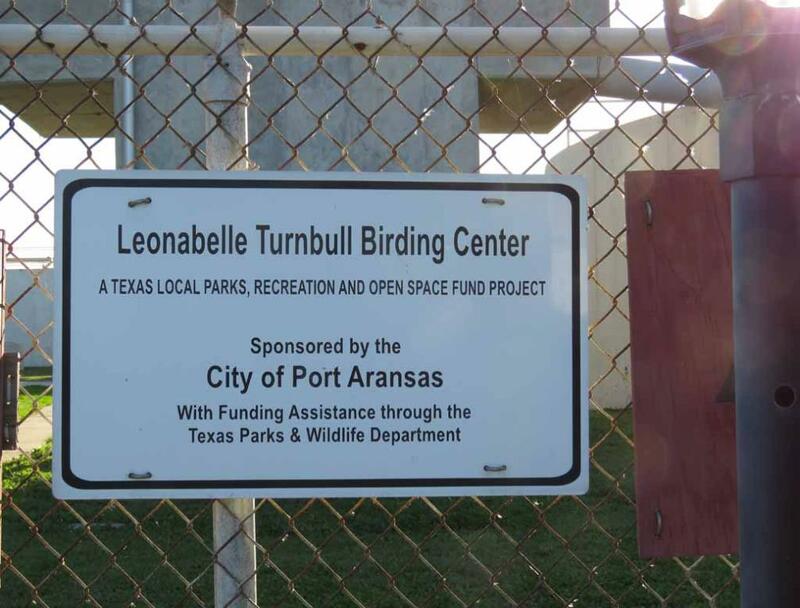 The Sign and the Kiosk near the fence about Leonabelle Turnbull Birding Center. 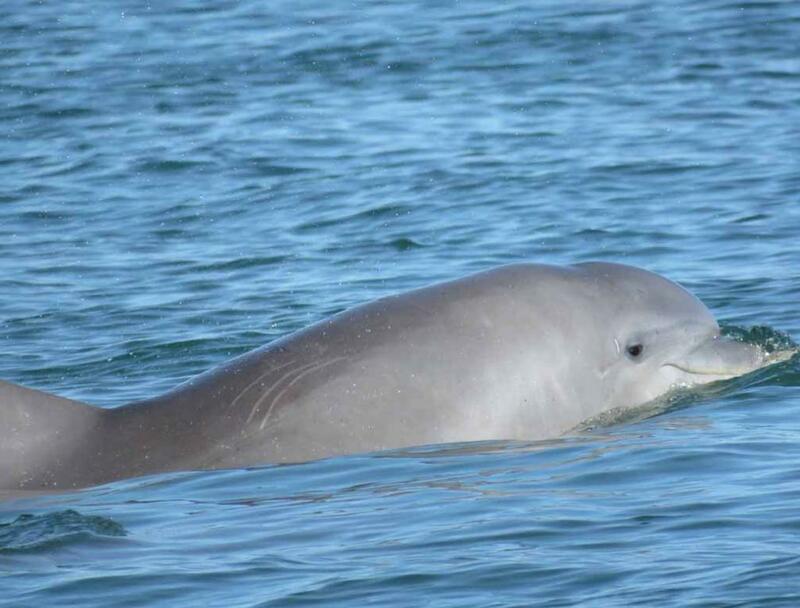 PM on January 29, 2015. 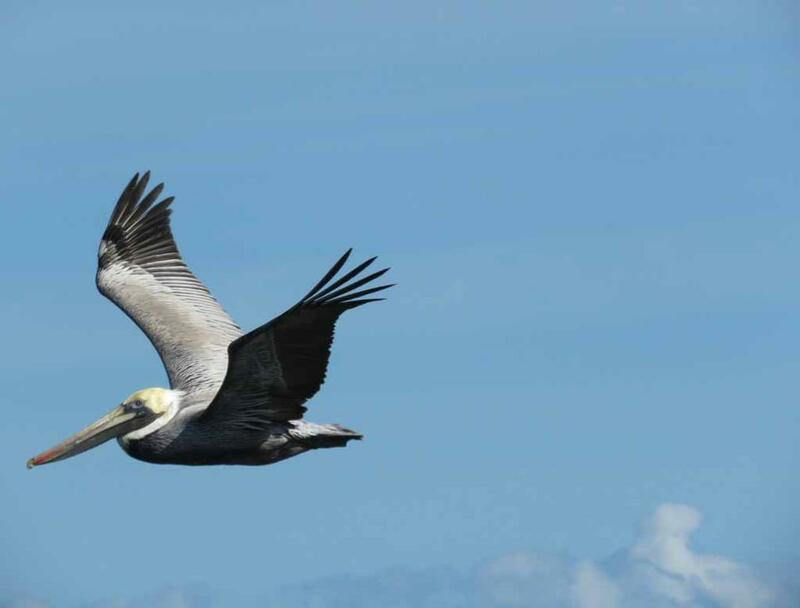 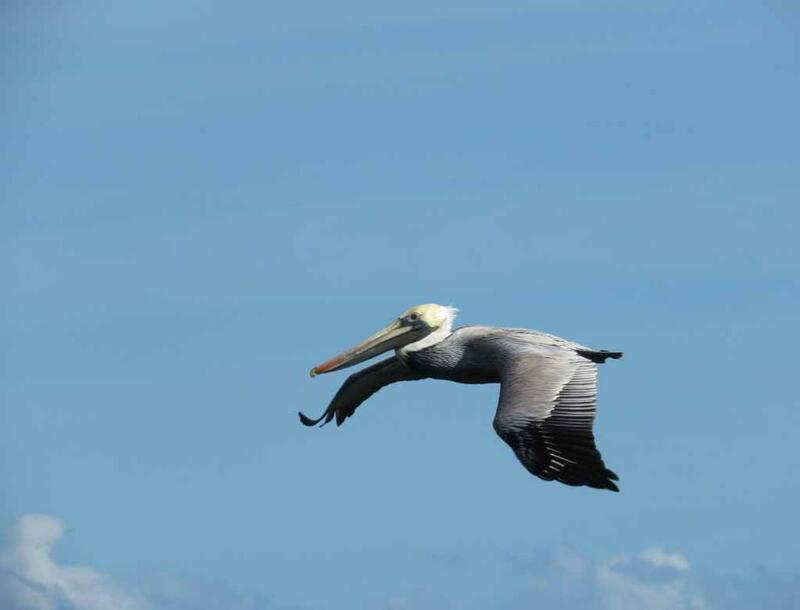 We also saw some pelicans and many other birds flying above or near our tour boat. 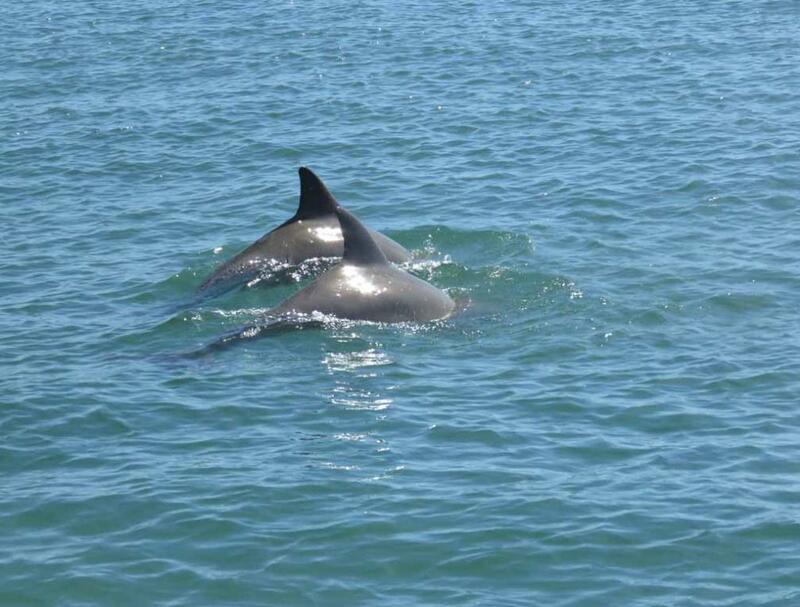 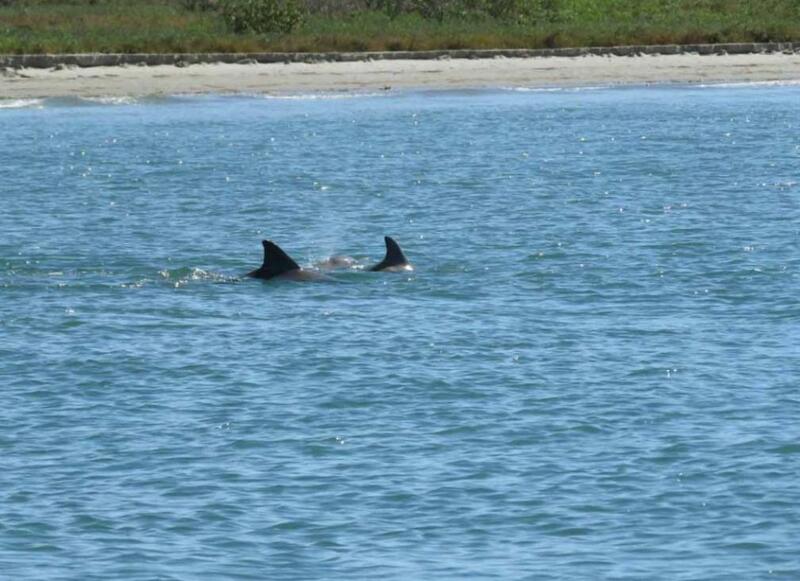 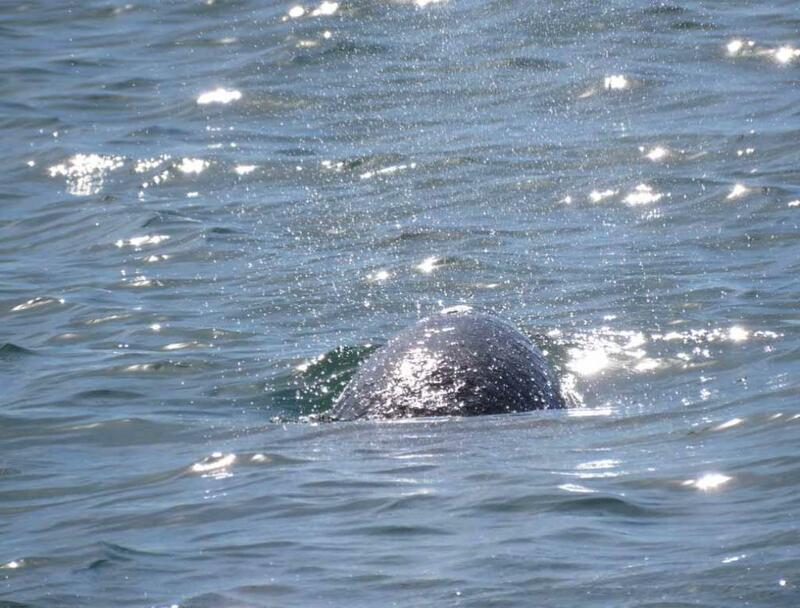 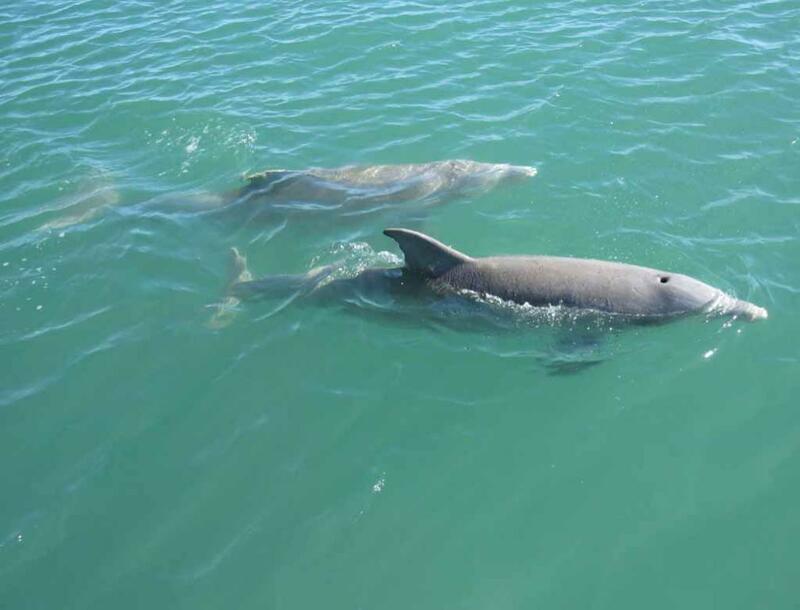 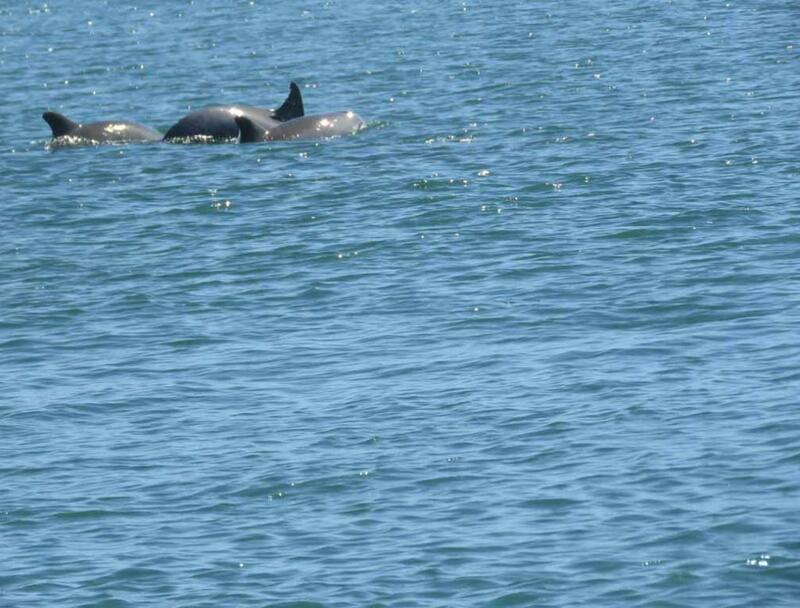 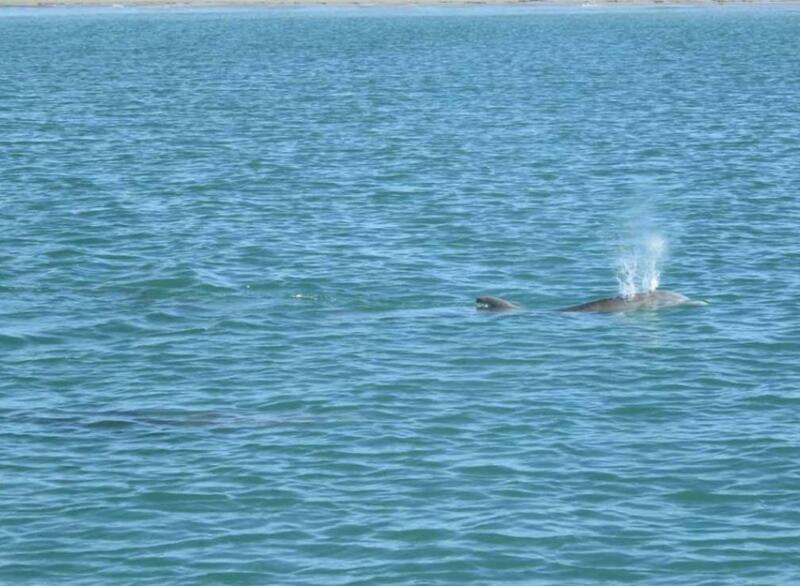 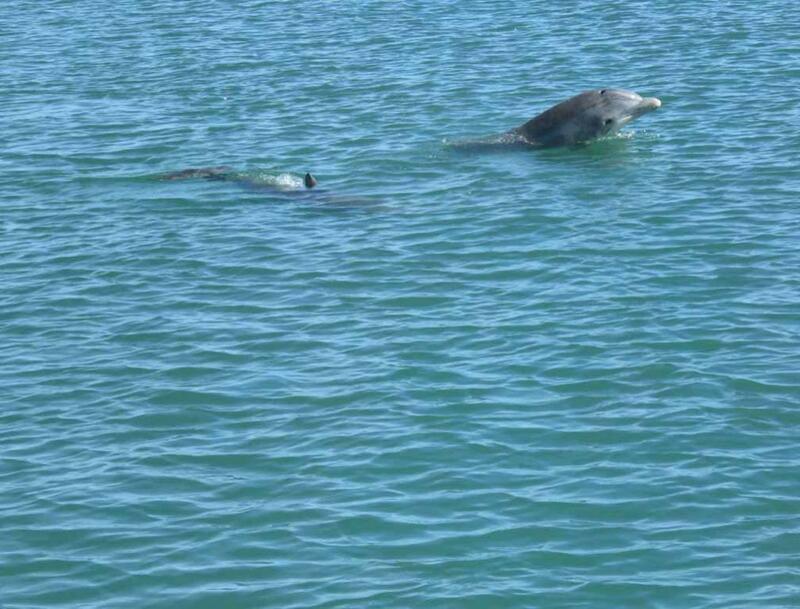 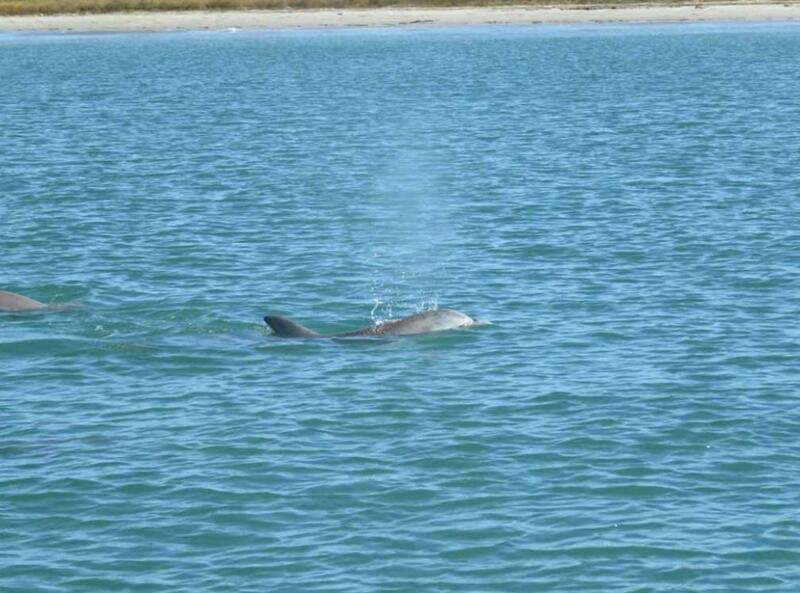 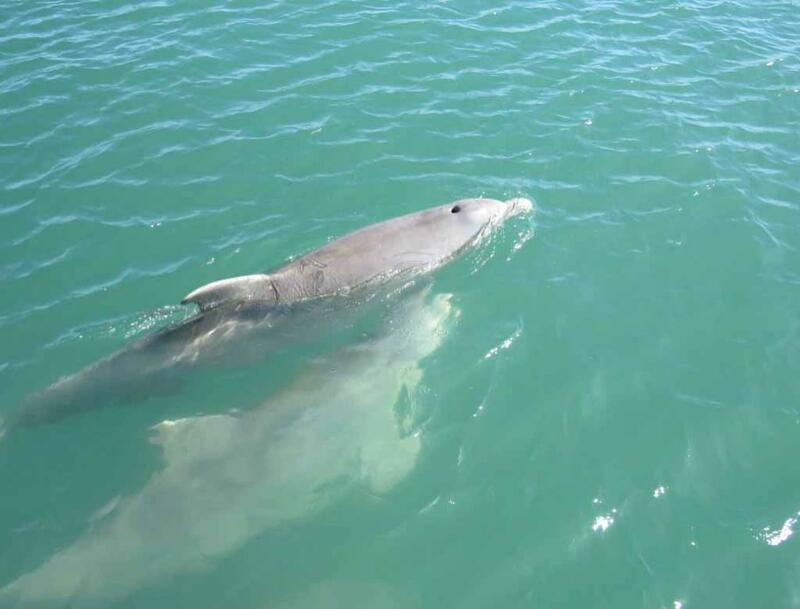 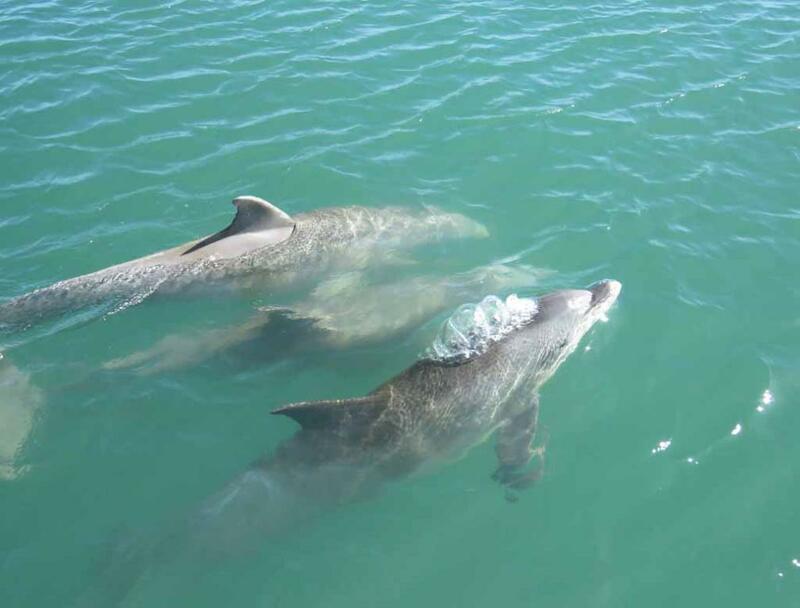 Sometimes the dolphins were very close to our tour boat such that we could see them up close. 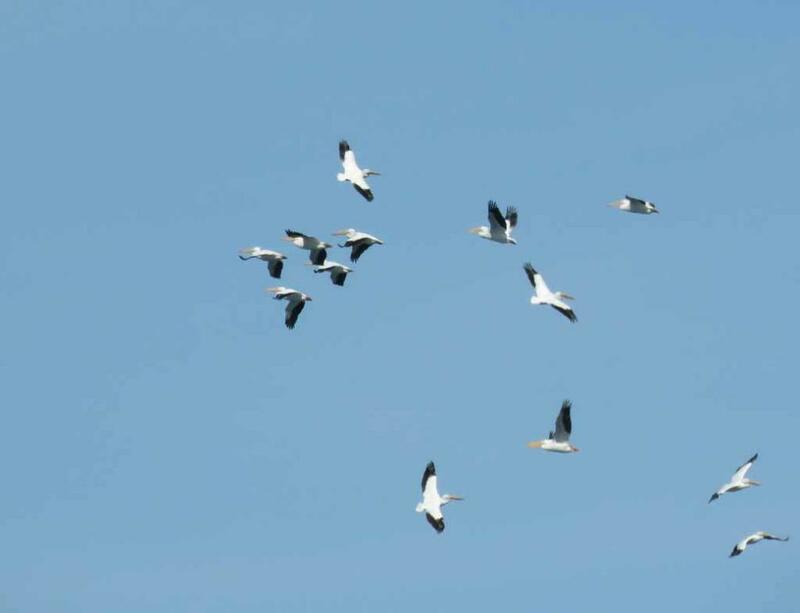 Many pelicans and cormorants are flying above the water. 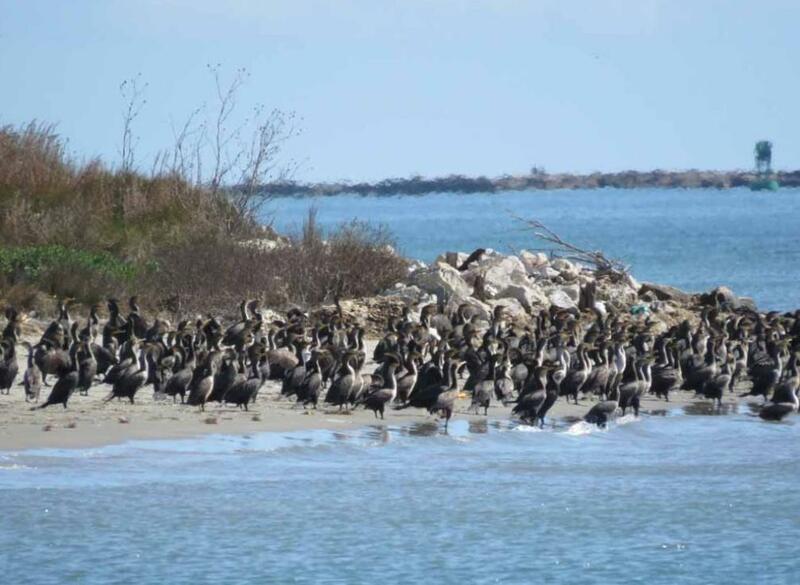 Many cormorants and pelicans on the beach/shore as seen from our tour boat. 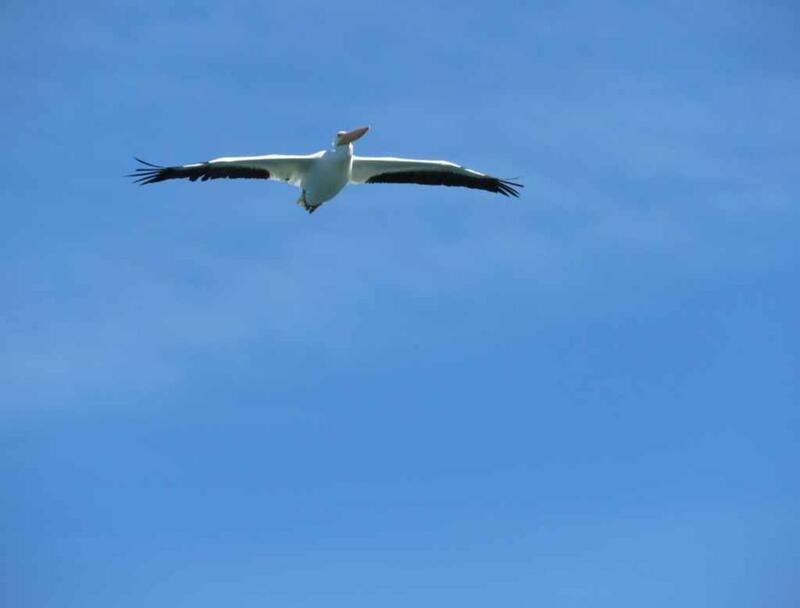 One of many white pelicans flying over our tour boat. 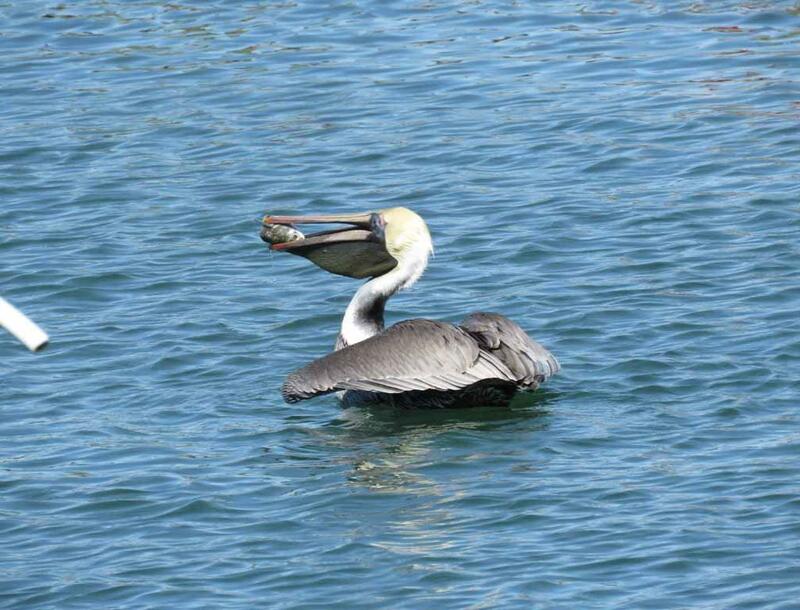 While we were waiting for the tour boat in the harbor of Port of Aransas, we saw this brown pelican got a fish. 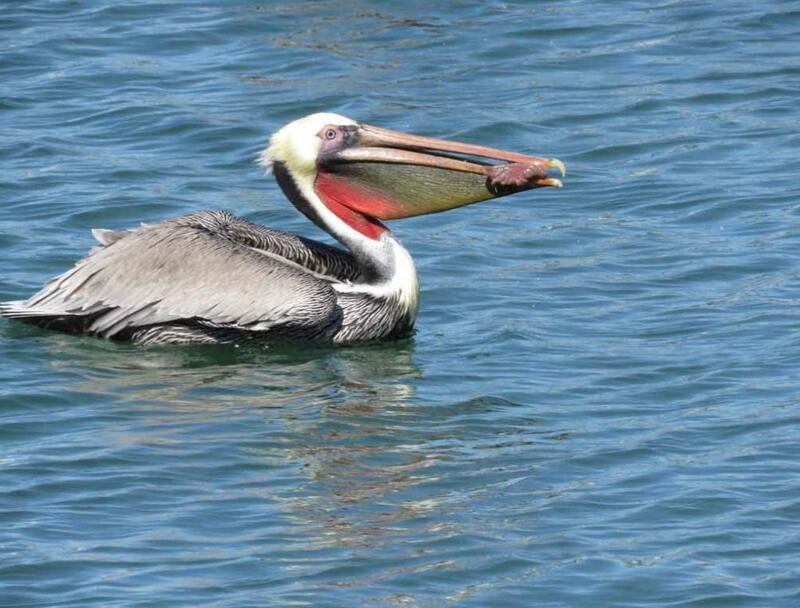 feeding these pelicans by through something for them to eat. 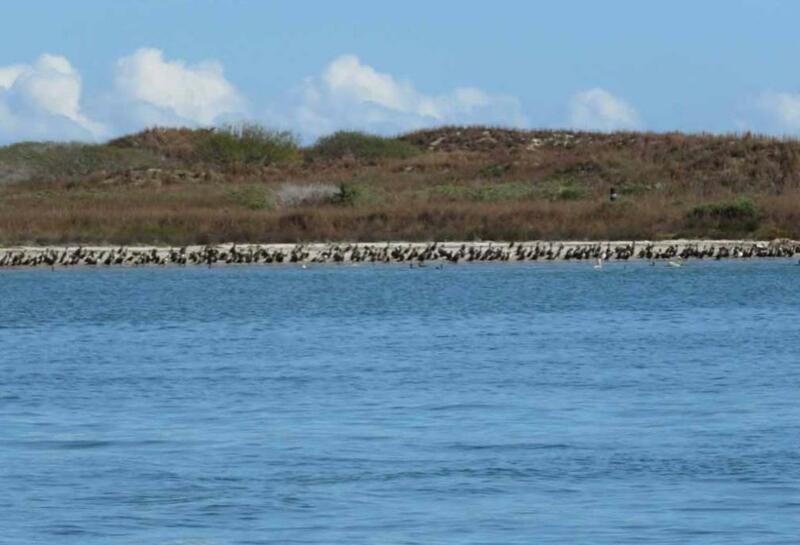 of the tour boat and they only make the trip if at least 10 people reserve for the trip. 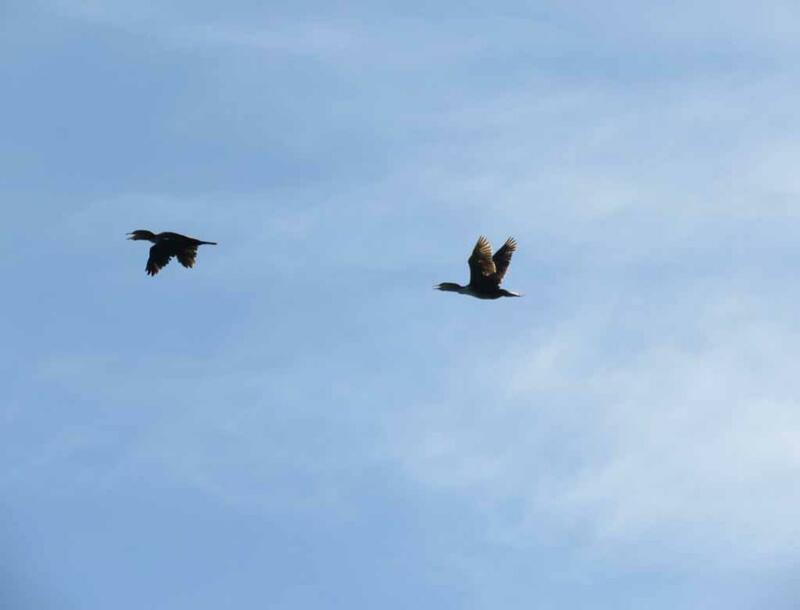 5 minutes of driving between them. 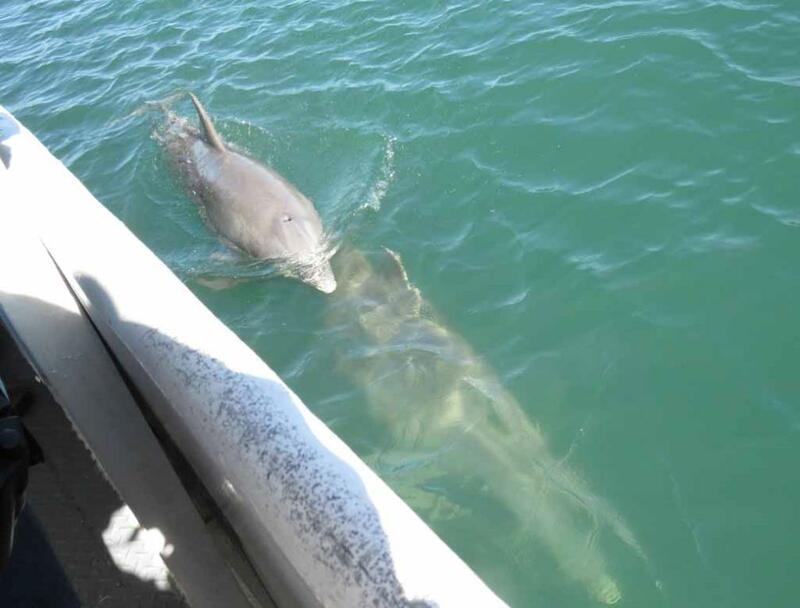 swimming ahead, on the side or under the boat. 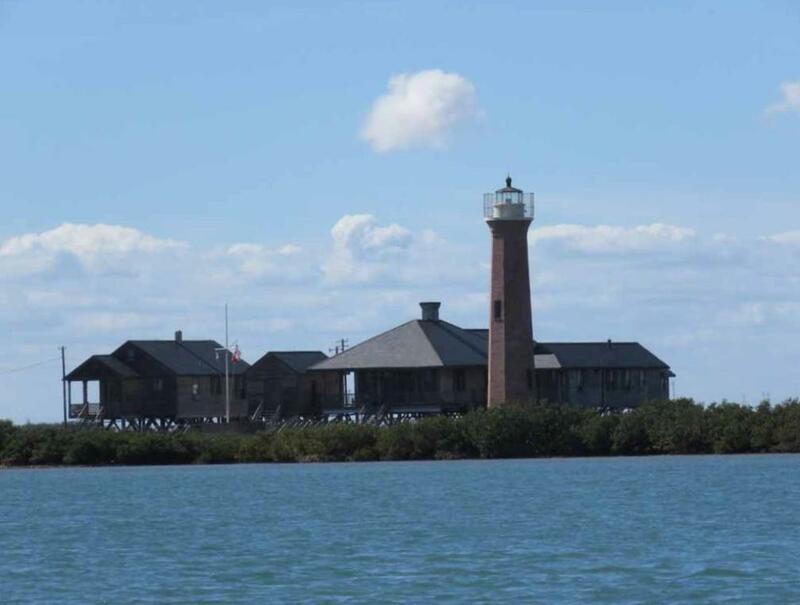 Lydia Ann lighthouse near Aransas Pass. 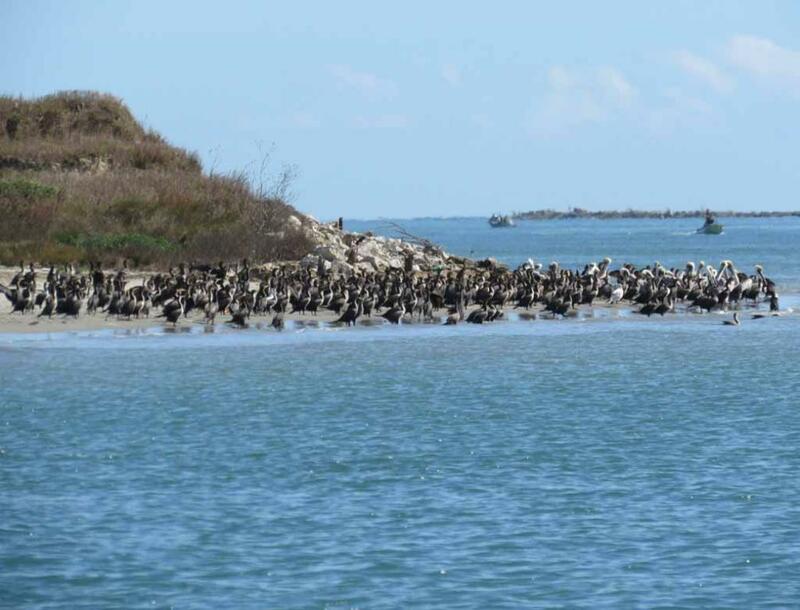 pass leads to the port of Corpus Christi, located twenty miles or so to the west. 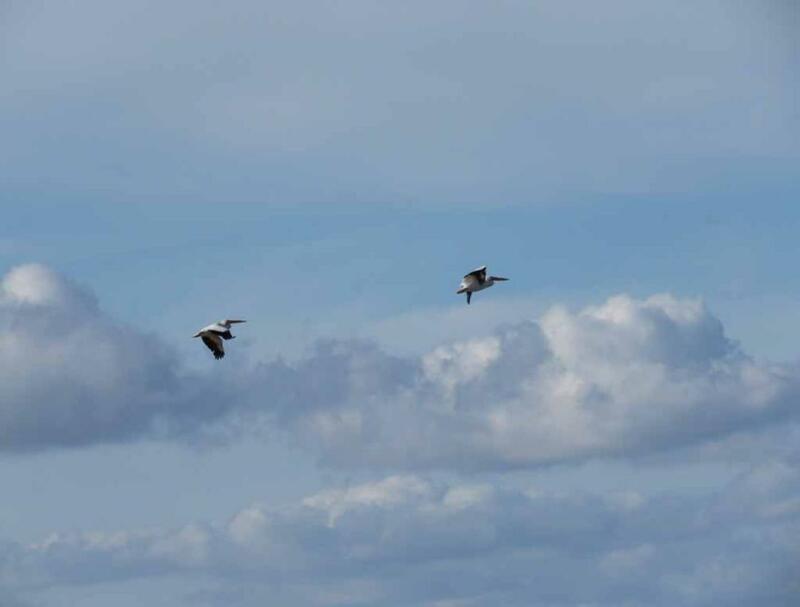 other kinds of birds in the water, on the shore and flying in the sky in the afternoon of January 29, 2015. 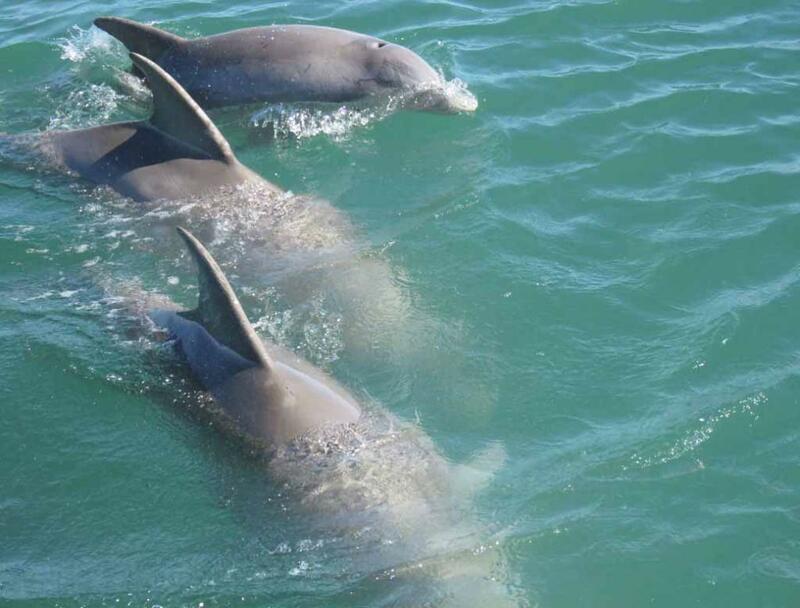 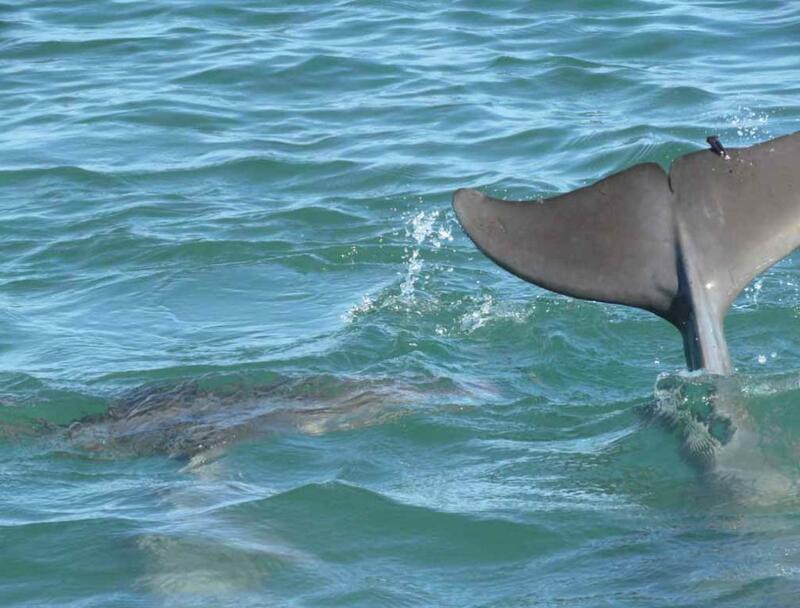 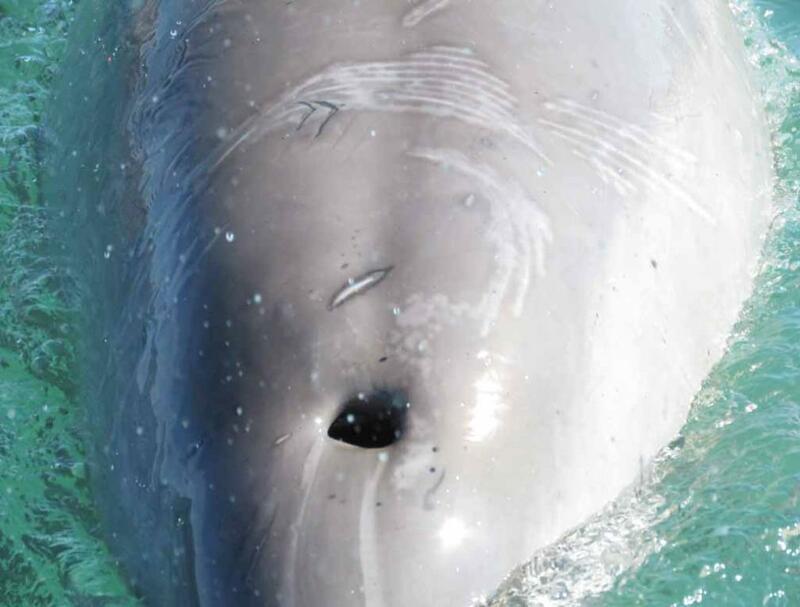 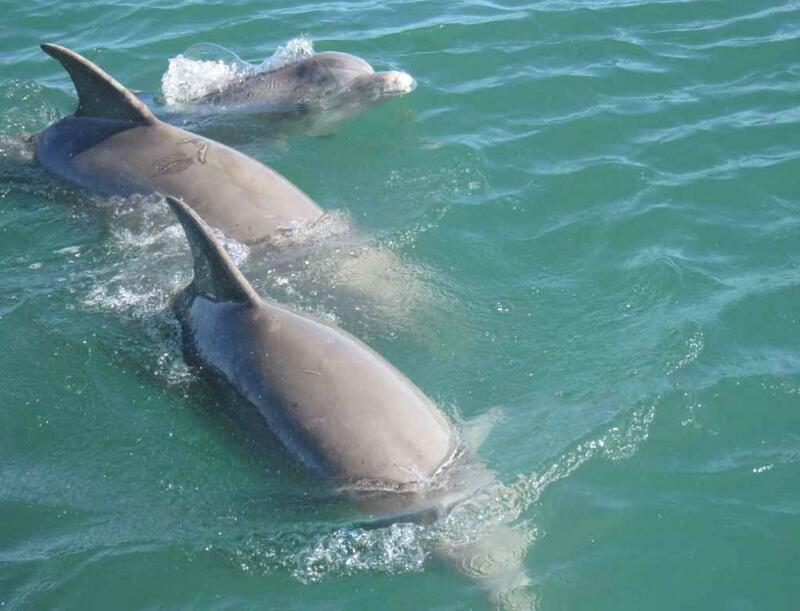 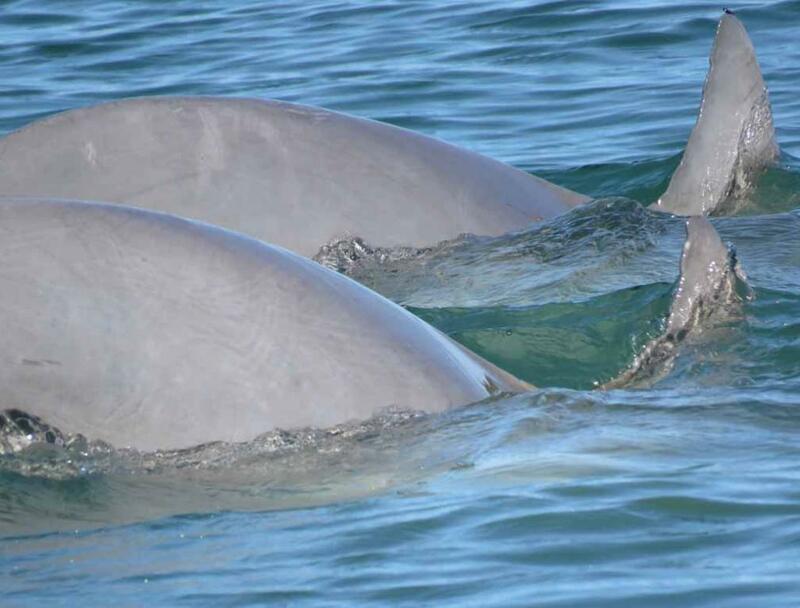 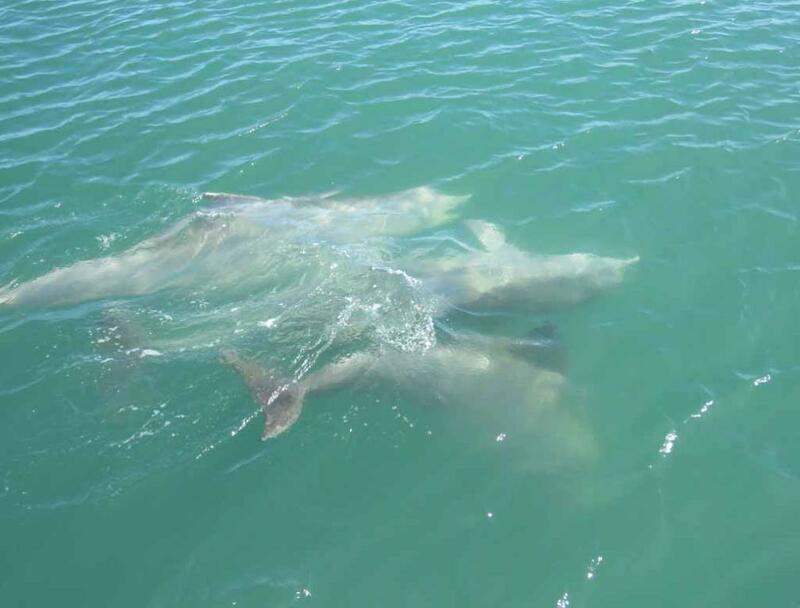 These dolphins are playing with each other under water. 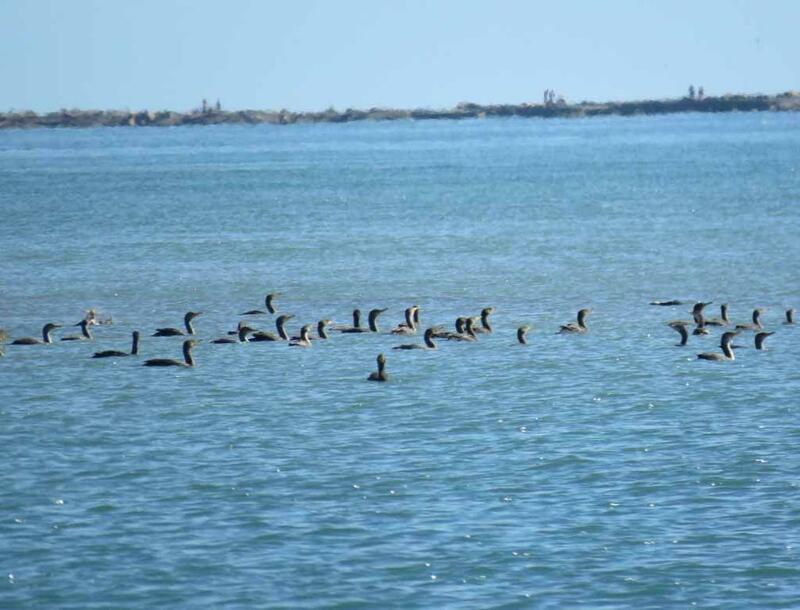 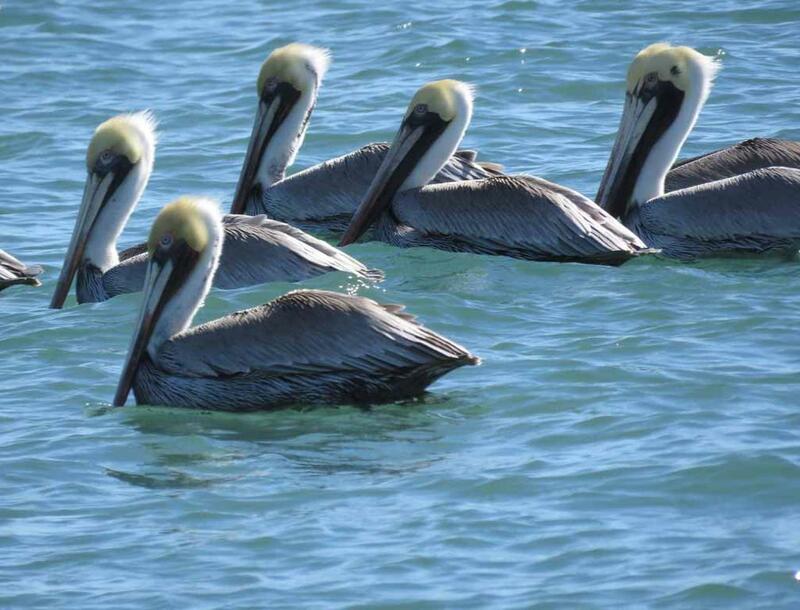 Many Pelicans and cormorants on the water. 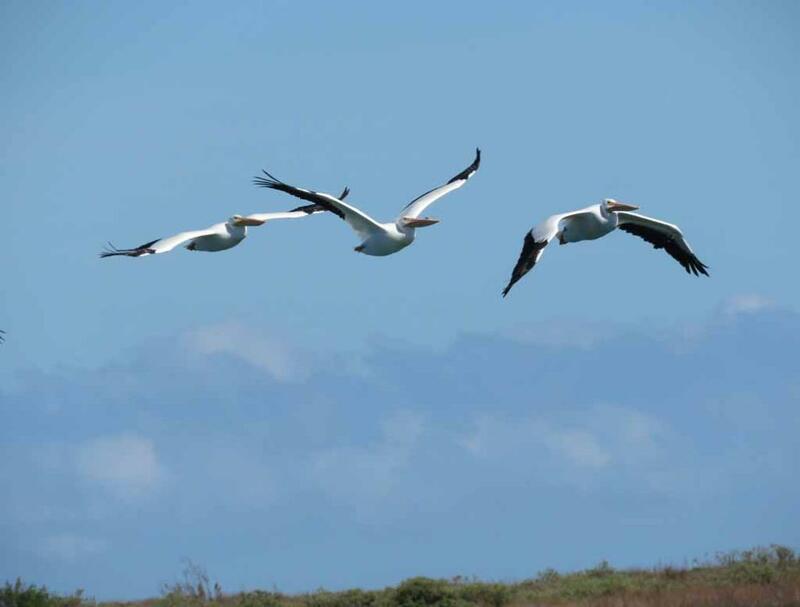 A flock of white pelicans in the air. 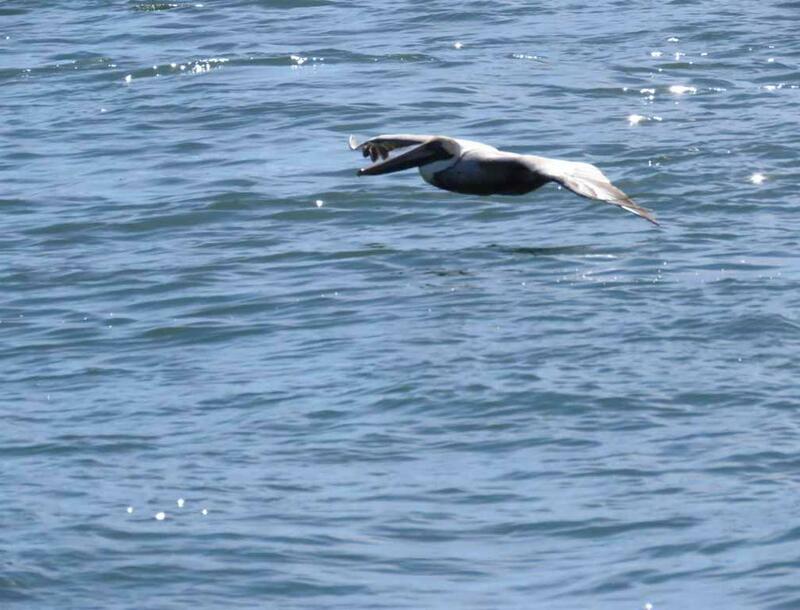 One of several brown pelicans flying just above water. 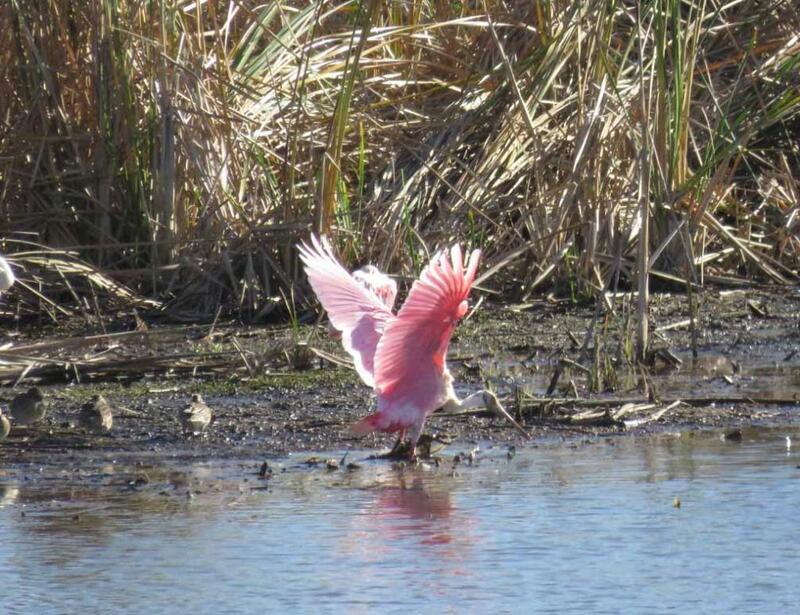 Roseate spoonbill is named for its pink feather and spoon shaped bill. 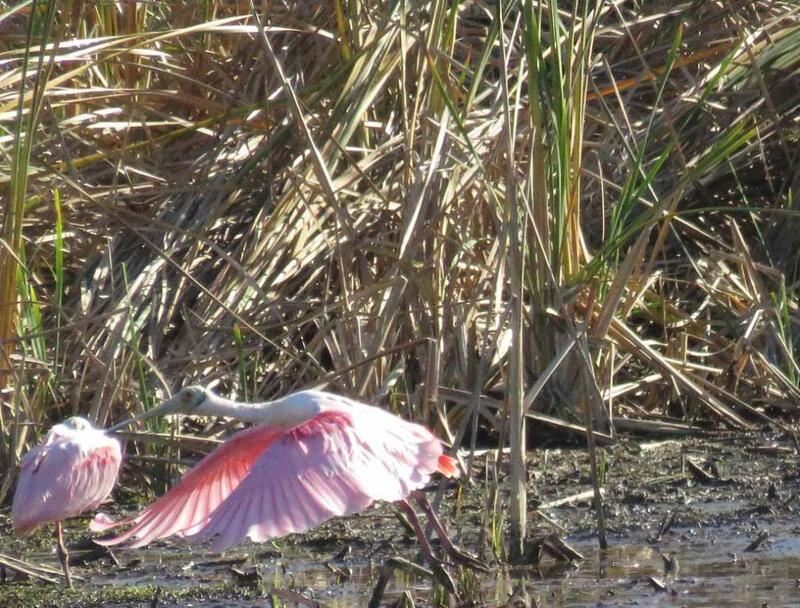 The eyes and legs are red. 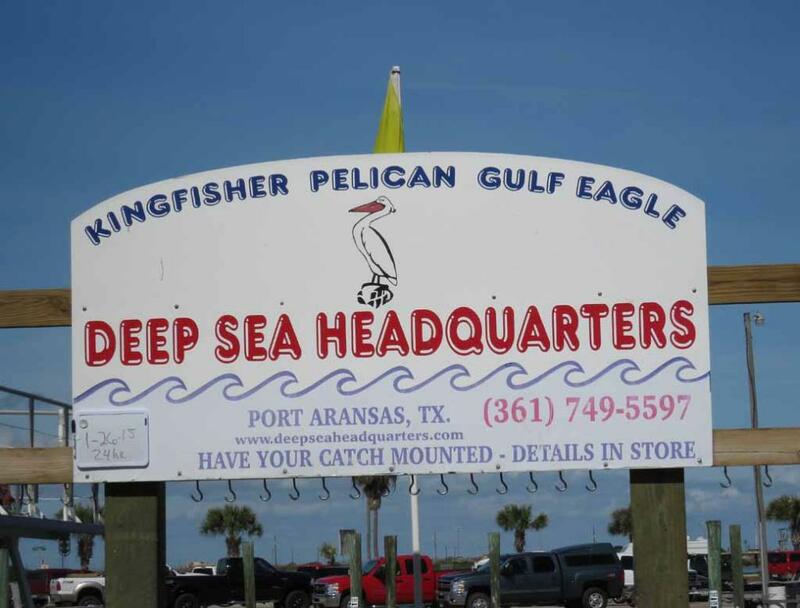 great prices right from the boat. 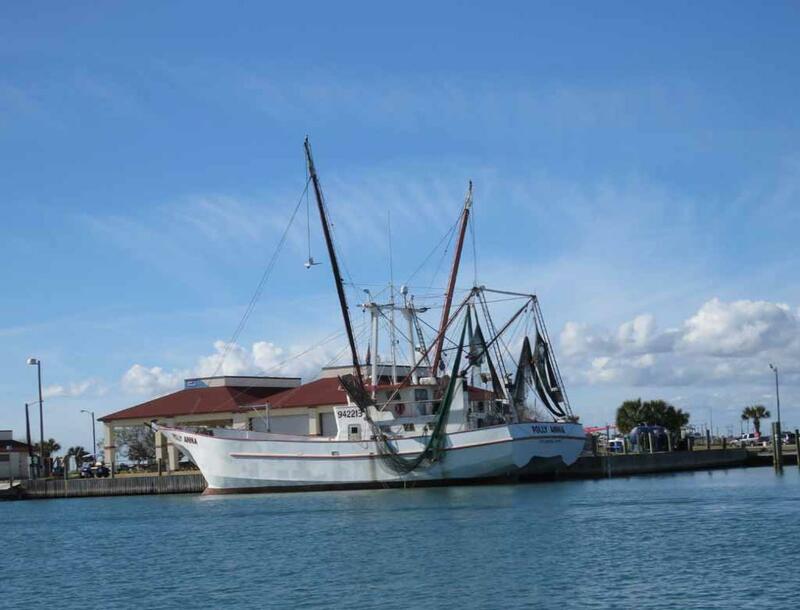 Three more shrimp boats dock in Aransas Pass at Conn Brown Harbor. 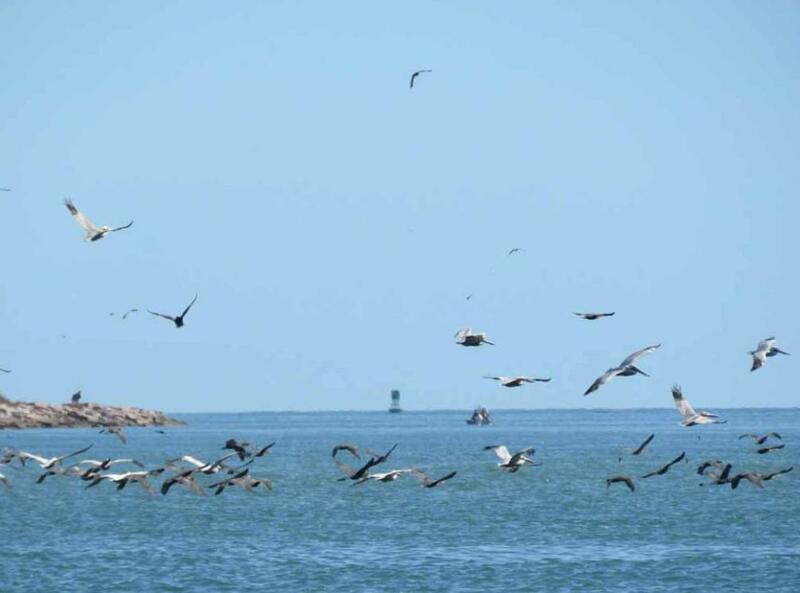 birds and dolphins all like it here means that the water and the environment here are very clean and healthy. 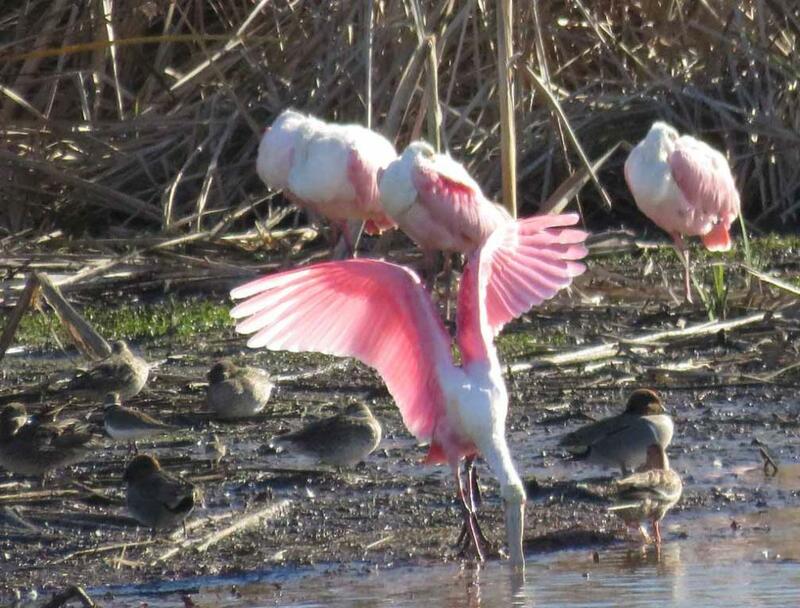 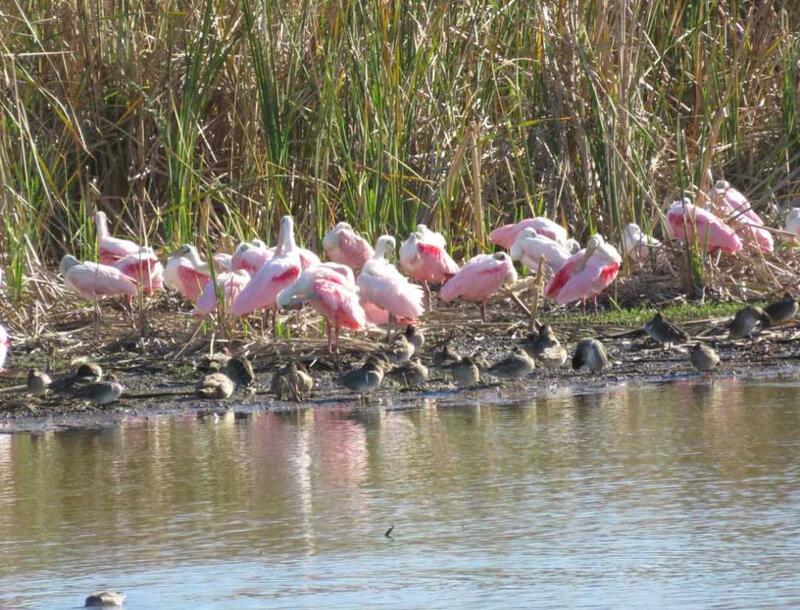 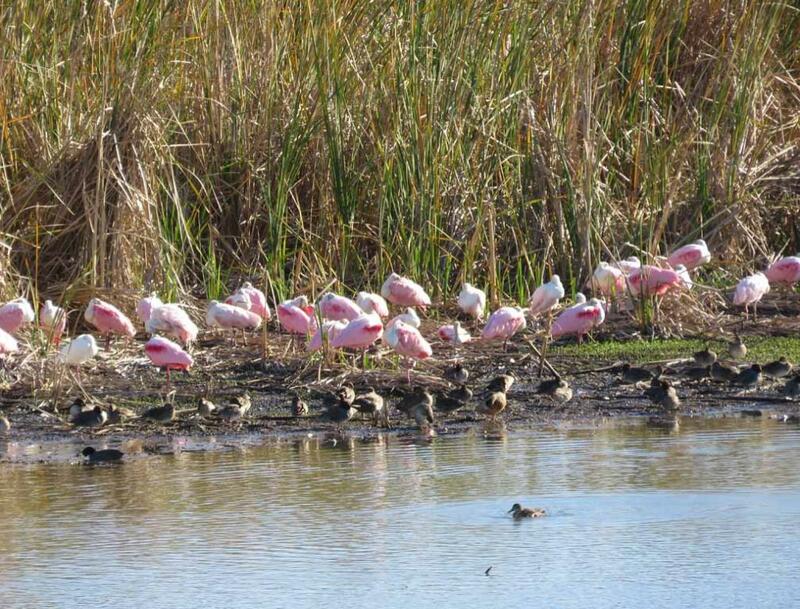 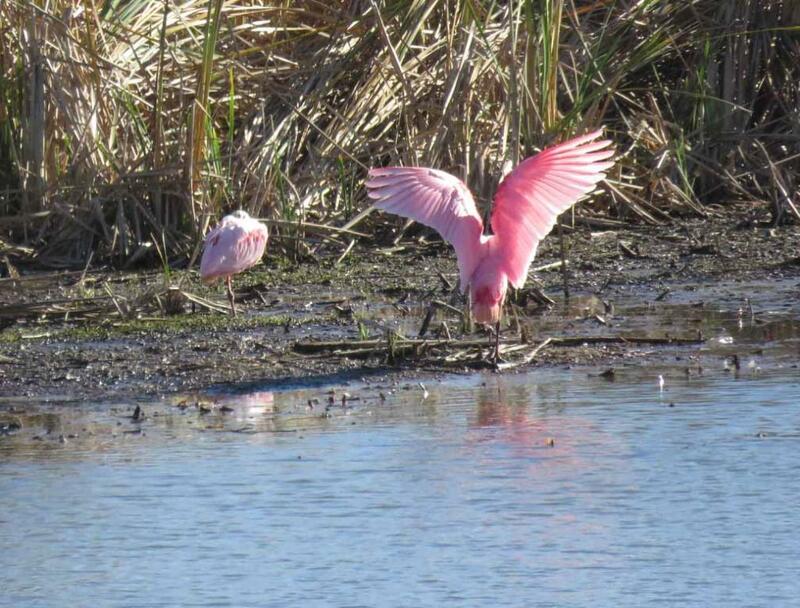 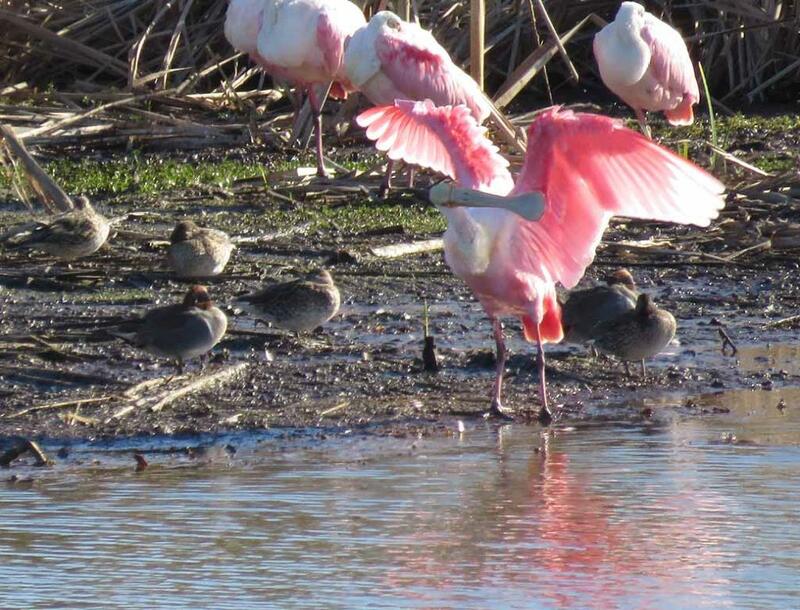 Our friends had also seen many roseate spoonbills in Merritt Island National Refuge in Florida.